We had three generations of women in one family attend the 2014 Triennial Gathering of the Women of the Evangelical Lutheran Church in America (WELCA). Here is a report of this special event from Colette Wunderlich, who attended with her daughter Cindy and her granddaughter (and Cindy’s daughter) Janette. 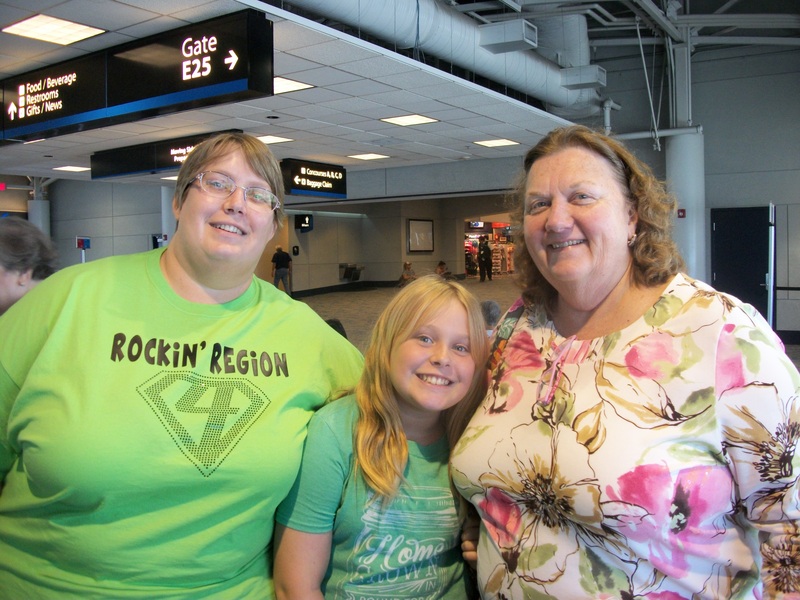 See the photo above of these three generations at the airport on their way to Charlotte, NC, for the gathering. Thank you to Colette, Cindy and Janette for representing MLLC at this special event. Cindy, Janette, and I are thankful for the opportunity to attend the Triennial Women of the ELCA Convention in North Carolina in July. We would like to thank Martin Luther Women of the ELCA for their financial and prayerful support. The theme was “of many generations” and we three generations were proud to represent MLLC. Several babies were in attendance and at least six ladies over 90 years of age. We attended Bible studies, workshops, worship, communion, and servant events. There were guest speakers, offering opportunities, and singing with no inhibition in English, Spanish, and Swahili. They put the words up and everyone sang, 2400 of us! Many of the 50 states were represented and the Virgin Islands. Our Companion Synod sister from The Central African Republic was unable to leave her country. The workshops I attended were Streets to Live On: A WELCA Model about organizing or renewing units, Generations: The Quilt of Our Lives with great stories by Mrs. Alex Haley, Better Understand Mental Illness, and Story Matters which encouraged continual growth in faith love, and obedience in the will of God. I attended the WELCA unit workshop on Friday and wrote down many ideas from others but didn’t think any were just right for our younger women. Cindy attended that same workshop on Saturday and I was so excited when she came out and said, “Mom, I think I’ve got it, an idea for our younger women!” I’ll let her tell you about it sometime. We were told any group that does things in the name of WELCA, like our quilting group, whether there is Bible study or not, can be counted as a WELCA group. 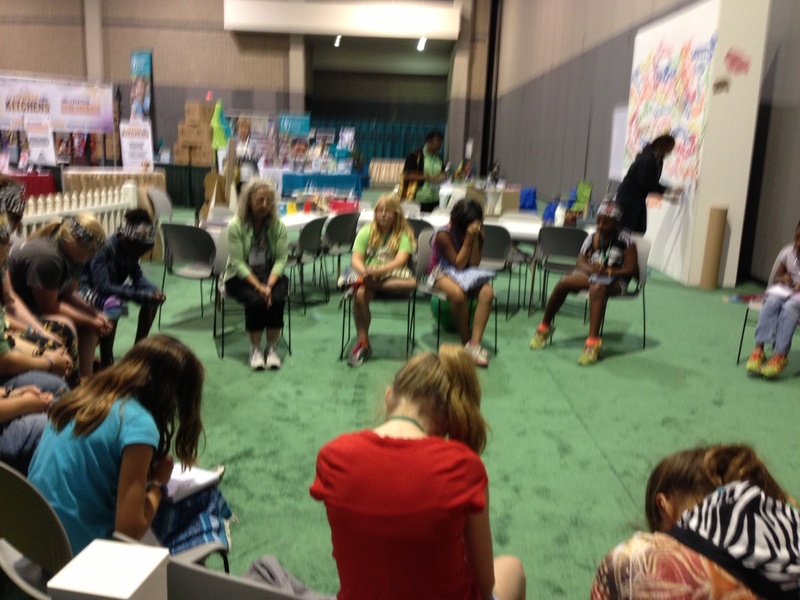 During our workshops, Janette attended the group events for about 20 girls including quilting. Of course there was time for food and drink. We walked several blocks one night to eat at Emeril’s Charlotte, NC restaurant and I managed to sample some North Carolina beers. The next Triennial Convention will be in Minneapolis, MN in July 2017. I’m going to start saving now. Janette shown with many of the other girls at the Triennial Convention. 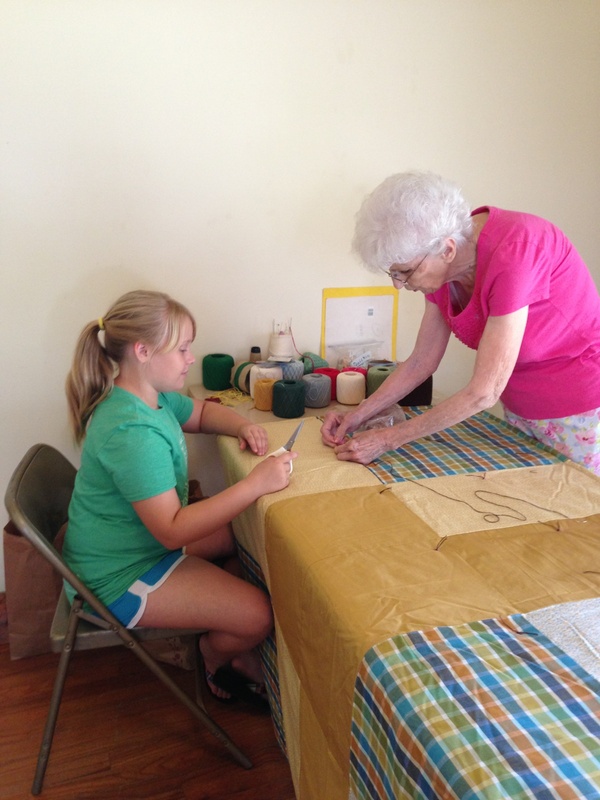 Janette back home in Carmine quilting with a mentor/friend Jenell.